Self-assembled battery; magnetic diode; better piezoelectrics. 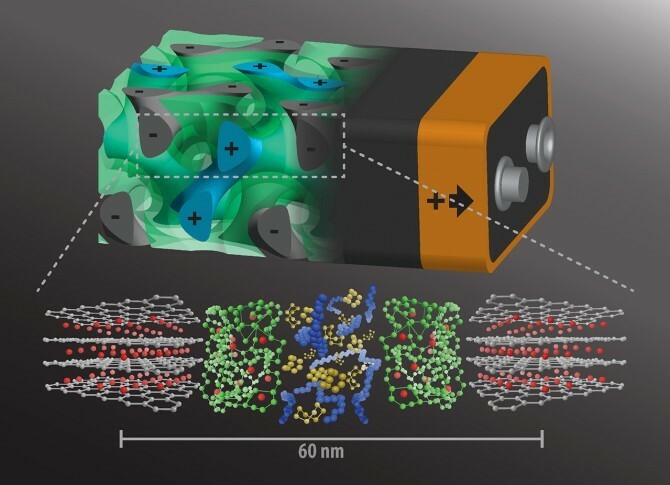 Researchers at Cornell University developed a self-assembling battery capable of near-instant charging. Instead of having the batteries’ anode and cathode on either side of a nonconducting separator, the team’s new approach intertwines the components in a self-assembling, 3D gyroidal structure, with thousands of nanoscale pores filled with the elements necessary for energy storage and delivery. Gyroidal thin films of carbon, which serve as the battery’s anode, are generated by block copolymer self-assembly and feature thousands of periodic pores on the order of 40 nanometers wide. The pores were then coated with a 10nm-thick, electronically insulating but ion-conducting separator through electropolymerization, which by the very nature of the process produced a pinhole-free separation layer that helps avoid battery fires. The next step was the addition of the cathode material – in this case, sulfur – in an amount that doesn’t quite fill the remainder of the pores. Since sulfur can accept electrons but doesn’t conduct electricity, the final step is backfilling with an electronically conducting polymer known as PEDOT (poly[3,4-ethylenedioxythiophene]). The battery is still in proof of concept stage, and several challenges remain to work out. In particular, volume changes during discharging and charging the battery gradually degrade the PEDOT charge collector, which doesn’t experience the volume expansion that sulfur does. The team has applied for a patent on the work. Researchers at the University of Missouri have proposed a magnetic diode, which they hope could greatly reduce the power demands of electronics. 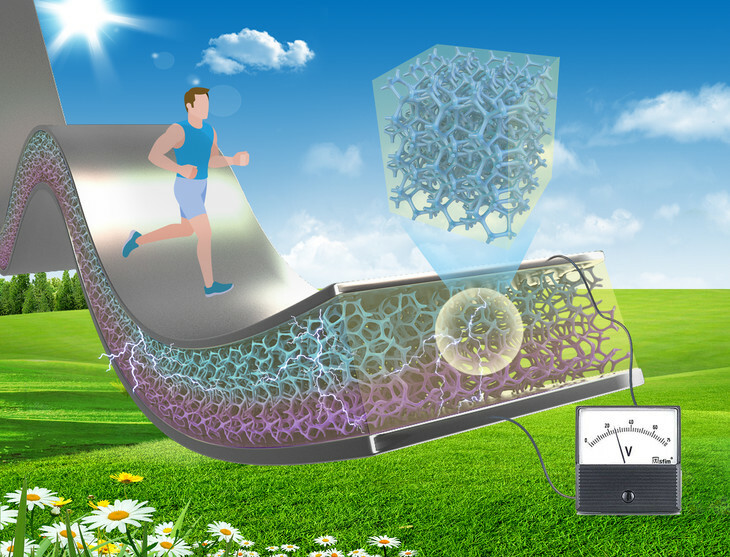 The team developed a two-dimensional, nanostructured material created by depositing a magnetic alloy, or permalloy, on the honeycomb structured template of a silicon surface. The new material conducts unidirectional current, or currents that only flow one way. The material also has significantly less dissipative power compared to a semiconducting diode. The team sees the magnetic diode as a first step toward new magnetic transistors and amplifiers that dissipate very little power, increasing the efficiency of the power source. Engineers at Pennsylvania State University and Huazhong University of Science and Technology propose a composite material that could improve the efficiency of piezoelectric energy harvesting devices 10-fold. Typically, piezoelectric devices use hard ceramic nanoparticles or nanowires added to a soft, flexible polymer support. The polymer provides the flexibility, while the piezo nanoparticles convert the mechanical energy into electrical voltage. But these materials are relatively inefficient, because upon mechanical loading the mechanical energy is largely absorbed by the bulk of the polymer, with a very small fraction transferred to the piezo nanoparticles. While adding more ceramic would increase the energy efficiency, it comes with the tradeoff of less flexibility. Working off the concept that the connectivity of the piezo filler determined the efficiency of the piezoelectric effect, with more efficiency gained from a three-dimensional material that allows mechanical energy to be transported directly through the material instead of dissipating into the polymer matrix, the team turned to cheap polyurethane foam dusting sheets common at home improvement stores. The small uniform protrusions on the sheet act as a template for forming the microstructure of the piezoelectric ceramic. The researchers applied the ceramic to the polyurethane sheet in the form of suspended nanoparticles in solution. When the template and solution are heated to a high enough temperature, the sheet burns out and the solution crystalizes into a solid 3-D microform foam with uniform holes. They then fill the holes in the ceramic foam with polymer. The team is working to improve the material with lead-free and more environmentally friendly alternatives to the current lead-zirconium-titanate ceramic.